It started because of a shared problem: the drug activity and prostitution in the abandoned double lot on Saltonstall and Lloyd. Adeli D. lived next door at the time, and remembers having to yell at the dealers who wandered through her driveway past her playing toddler to the empty house beside hers. Eventually, the young Puerto Rican mother’s activism attracted the attention of Officer C., an older Italian-American policeman, and his wife. Though the neighbors had different backgrounds, their goal was the same: keep crime off the street, and turn the lots into something useful. The solution came a few years later in 2002 when Officer C. applied for and received an Urban Resources Initiative (URI) Greenspace grant. The city had since purchased the land and demolished the houses, leaving a vacant lot. Adeli and her mother, Elba, helped the officer from the project’s beginning. They constructed within the first summer a low-maintenance garden complete with nine trees, five rose bushes, and three benches. During the site’s first few years, plantings in the lot and on surrounding streets were frequent. Adeli and Elba always came out with their neighbors to help. “When we started the garden, it was pretty much every day,” Adeli remembers. She worked hard to recruit more volunteers, especially among her family. There are pictures of her aunts, uncles and cousins getting their hands dirty: “Those were the people who couldn’t say no,” she says. Adeli’s family has a long history in the neighborhood. Elba was one of ten children. 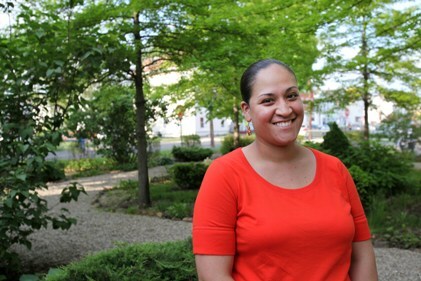 She moved with her family from Puerto Rico to New Haven when she was nine, her parents seeking factory jobs and the American dream. Adeli’s grandfather worked two or three jobs until he could buy a house on Lloyd Street. Adeli today lives in the same house. The family eventually bought two more houses on the block. Adeli’s roots in the neighborhood and love for the garden encouraged her to step into a more active leadership role when Officer C. moved out, a role she was able to adopt with ease and natural proficiency. She reached out to her neighbors and recruited across all ages. To old-timers, she knocked on doors and introduced herself as Victor M’s granddaughter. With schoolchildren who volunteered, she directed using her skills and background as a teacher. Adeli can talk, assign tasks, and keep the mood light when in charge, but perhaps her greatest strength is in leading by example. She waters the trees, cuts the grass, picks up the trash. “When we started, lots of people didn’t care, they said, ‘young girl, you’re a fool, why you want to work yourself to the bone, they’re gonna rob your plants…’” The site has experienced vandalism, litter and theft. But Adeli keeps going. “And they just see us keep working, and eventually they came too,” she says. In recent years the site has become an Emeritus Group, meaning attention is shifting from planting to stewardship. With fewer big planting events, Adeli and her mother have become the site’s primary caretakers. Adeli’s attitude towards the site has changed with its evolution and the events in her own life, but her commitment has remained strong. -Contributed by the New Haven Urban Resources Initiative.